Whether you’re a fan of raised wagons or not, this video starring none other than the recently-announced Opel Insignia Country Tourer will make you want one. At the least, it will increase the probability of you wanting one. Probably. 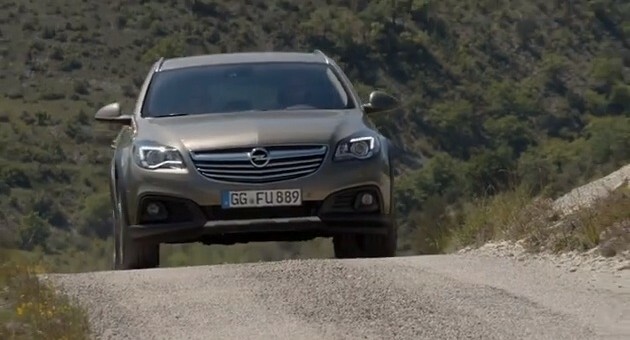 The minute-long spot that’s available below first shows the new raised Insignia wagon driving on some smooth country roads to a dub step beat. Then, the music switches to a modern instrumental melody as the driver turns from the blacktop onto a path that’s either not at all paved, or paved very poorly — demonstrating the Country Tourer’s ability to soak up both kinds of terrain. On the official Opel facebook page an Opel guy said that beside the Monza Concept and the Adam Rocks there will be another “surprise” on the motorshow. So perhaps new Insignia OPC!? Or the Adam opc? Since there’s a spy shot of it? Maybe to OPC & VXR Insignia, Adam however I’m thinking these are known to be coming soon, I’m thinking along the lines of something that is not in the current range – of that there is no Omega, Calibra, VX220/Speedster or large SUV of those four mentioned the biggest seller & probably profitable would be the Omega. Can’t imagine that there will be such a big suprise like an entirely new car! There would have been some clues in the past if Opel would introduce a car like an Omega or Calibra! Calibra or any other coupe wouldn’t also make any sense because there is the Monza Concept wich would be needless. So I suggest we will see another Adam variant or Insignia OPC but nothing completely new! Yes that holds some weight that its not been caught camouflaged. Obviously a new Calibra is doubtful because of Monza & a 2dr Insignia probably won’t happen. A new Omega could be based around for example a Buick or Cadillac & adapted for European consumers. Please explain to me if opel has all these great cars that everybody wants then why does GM Europe struggle so much? Seems to me if opel was that good GM would not have any problems in Europe! But they do and have for a really long time! Nearly every European mainstream brand (Peugeot-Citroen, Renault, Ford Europe, Seat, Fiat group…) is struggling! Opel cars are good, the image is not thanks to GM’s behavior in the last 20 years! A good car is not enough to be successful, if your image was detroyed by GM! We have dozens of other strong brands in Europe and not just Opel and Chevrolet. Skoda has a smaller range of models as Renault or Hyundai, but sold more cars in Germany than other import brands. Overall, the number of new car registrations is shrinking in Europe, or more specifically in Western Europe; by 6.6% for Jan-Jun 2013 compared to the same period of 2012 (EU27+EFTA). This is a trend which is ongoing for many years. The reasons for this are not easily identified and are certainly manifold. One is the economic crisis, and the continued attacks on the living standard of working people (“reforms”), of the kind which our friend “scott” is always asking for. Just to stay with the automobile industry, PSA is closing the Aulnay factory (between Paris and the Roissy airport) with 1’400 workers; GM/Opel is closing the Bochum factory with about 3’000 workers. And we all know, unemployed do rather not buy new cars. Then there is what I consider a saturation of the market. Nobody needs a second or third car, when there is no room for it to park near ones home. The also the improvement of public transit and high speed trains, which for many journeys make it faster or more comfortable to use a car for that trip. And, related to this, the expansion of car sharing. This is the general picture all over Europe; in Western Europe, which is covered by the ACEA statistics, only Belgium, Denmark, Estonia, the UK, and Norway have reported an increase in new car registrations for Jan-Jun ’13 compared to the same period of 2012. Now, this might be different for countries in Eastern Europe, where there is still not yet such a market saturation, and no high-speed rail network of the extent which exists in France, Spain, Germany or Italy. This decline is hitting more or less all auto manufacturers, not only Opel and Chevrolet. And don’t think it is easy to introduce a new brand into a saturated market. Chevrolet commands today a market share of 1.2% in EU27+EFTA western Europe, because GM simply renamed the already established Dawoo cars and dealer networks. But try to find a Cadillac dealer — last time I checked, there were 6 of those in Germany, a country of about 80 million people. Even if now the new Cadillac cars are on par with the established premium brands Audi, BMW and Mercedes, it will take a long time for them to be noticed, and even longer to be accepted. It is not enough for a car to be performant, comfortable and economical, one wold also typically want that there is a service point near by, so that in any case one does not need to cross half of Europe to get a car serviced. When I was a kid, VW could offer only the classic Beetle, middle class was supplied by Opel and Ford, and by imports from France and Italy, upper class by Mercedes and also some Opel. BMW did not really count. There were no Japanese imports, no Korean imports, no Chinese imports. But the situation has changed. Mind you: the only constant in history is the constant change. The rised estate 4×4 market for many years starting from around the early 80’s was catered for by Subaru, it was a niche nobody else bothered with until now. I’d call this market a steady segment that won’t sell loads but will find some buyers. I think the Country Tourer will lure buyers away from the Allroad, Alltrack, Outback & XC70. I think that the Audi A6 “quattro allroad” station wagon is still in another league. It can, for example, lift the body by 6 cm instead of being just 2 cm higher, but fixed, as the Opel Insignia “country tourer”. In the end, it is the price / use value relation, and how a potential buyer sees this in relation to his or her budget. And if your car has to be able to pull a horse carrying trailer from being parked on a sloping wet meadow, and with how many horses in it. Until we know the details on what the Country tourer has maybe its slightly unfair to take for granted the A6 is better, we are also unsure on the price at the moment it could be priced nearer to A4 or even in between both. If the A4 is considered a rival the Counrty Tourer would have the bigger boot, so even now without a unbiased test of its rivals to determine which is the better it is down to what use or deciding factor each individual needs. Well, the A6 is one tick larger than the Insignia. The Insignia plays in the same league as the Audi A4. And the “allroad” version of the A6 station wagon has this variable ground clearance. But besides that, I did not want to impute that the Insignia Country Tourer would not be able to pull a horse carrier from a meadow. I just mentioned this since this is a really tough test. This video shows the Insignia CT only on paved roads, even if in various states of repair or rather disrepair, but not on open terrain. Can a A6 pull a trailer from a meadow? Y/N. I’m sure when there’s a comprehensive unbiased test with Country Tourer & it’s rivals we will know its strengths & weaknesses. As for off roading I guess it can pretty much hold its own within reason. I guess It’s not designed with serious off roading in mind anyway & nether are its rivals. Looks like an Acura ? And it even made it down a dirt path…OH MY ! Germans say that this is a new Insignia OPC. much different than the previous generation . I like the design — slightly raised to handle a rough road or sandy beach but sleek enough not to catch too much air. The roof, being a bit lower, is also more accessible than that of the typical SUV. It’s a good design in my view. Just make a smaller 40 MPG version, sell it in the U.S. as a Buick, and it’s my next car. I wonder if in a few months time if the GM/Fiat/VM 3.0 diesel would find its way into the Country Tourer, selling alongside & complementing the other engine options. The FIAT/GM joint venture engine development and VM Motori are unrelated. VM Motori, on the other hand, is a GM and FIAT 50:50 joint venture only since 2011 when FIAT took over the remaining 50% shares from Penske. I have not heard of any previous consultation between FIAT and GM about this transaction which made them JV partners. We need this model? Well I Really want one! Where is the roof Rack?